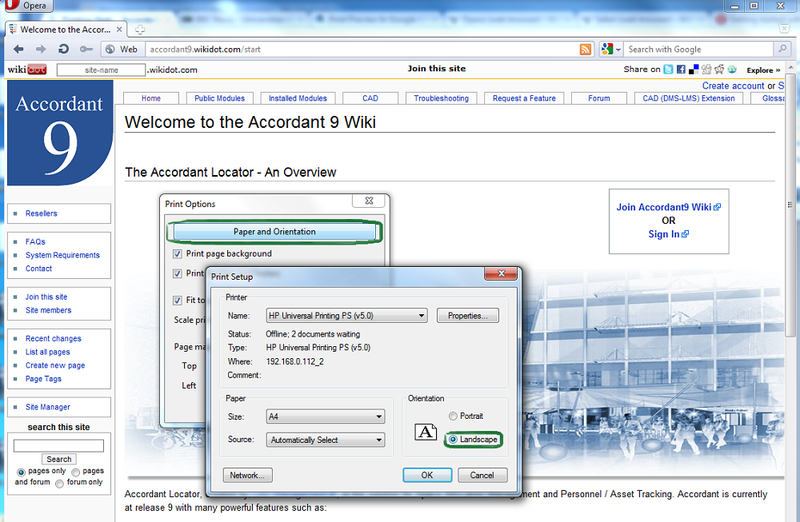 Please follow the following guide in order to optimize the quality of printouts of Accordant9 Wiki documents. 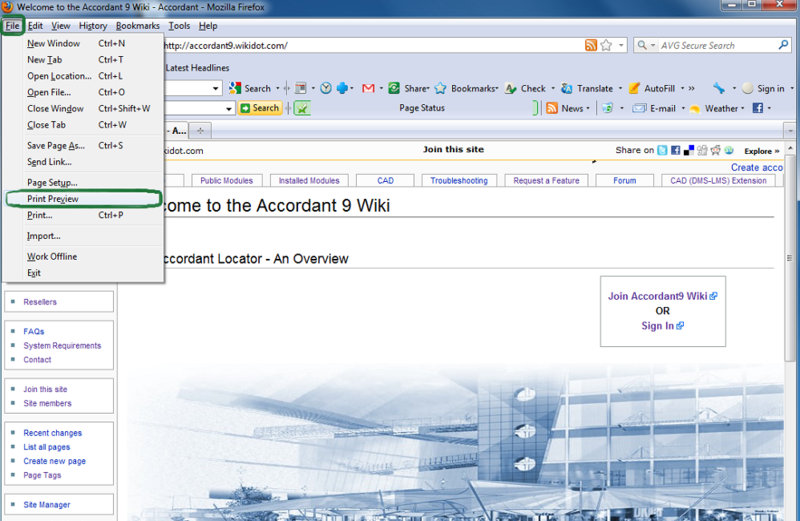 The IE has a print current webpage short-cut at the top right-hand side of the browser's tool bar along with a host of other short-cuts and features. 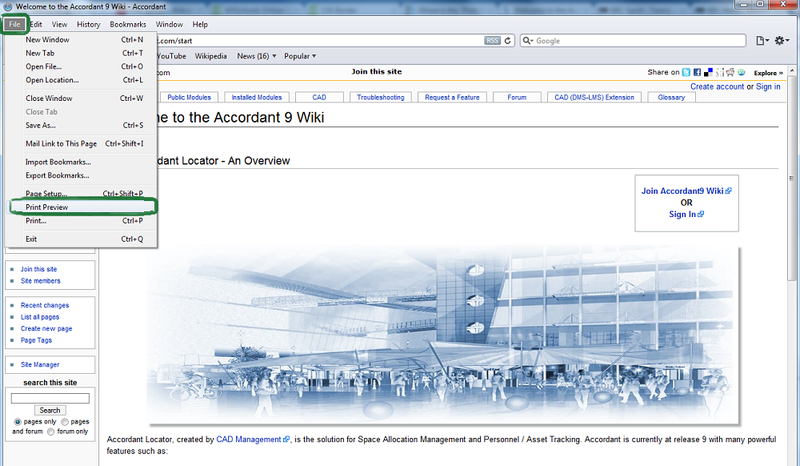 Now, the current Accordant9 wiki page at the browser is optimized for printing. Click on the print button to print. 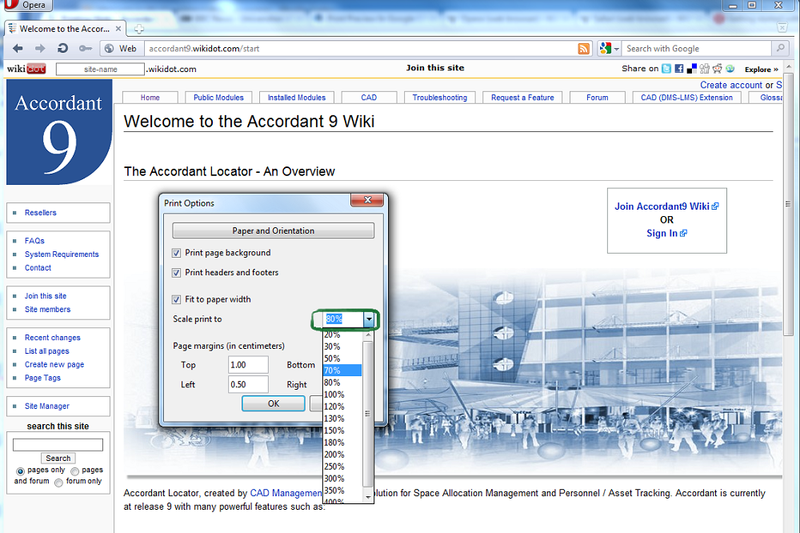 Select the File option from among the horizontal menu options present at the top left corner of the Firefox browser as shown in the following figure, and select the **Print Preview* option. This causes Firefox's print preview window to appear on the screen. By default, the printout is set up as Portrait and print size as Shrink To Fit. 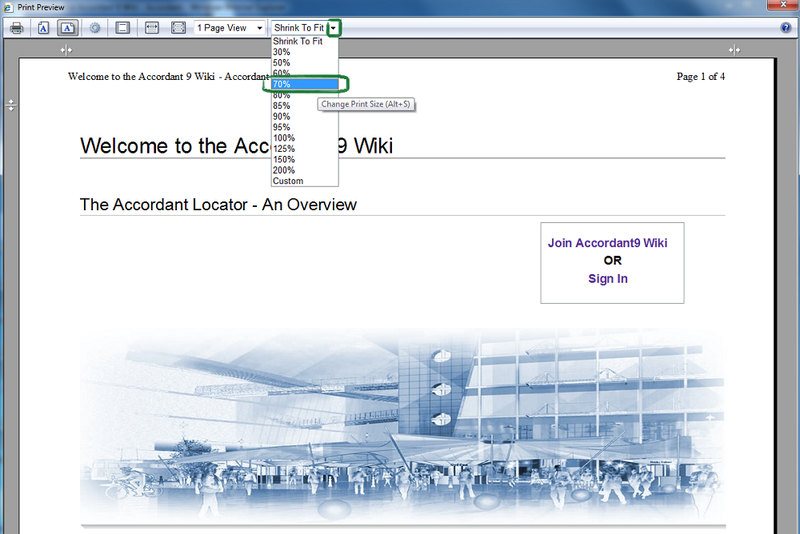 At the print options window alter the scale print to option to 70%. 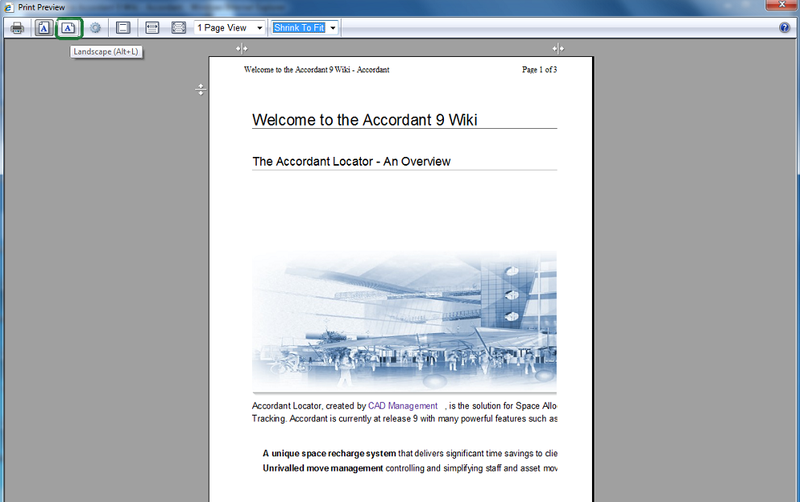 After this, access the print setup window by clicking on the "paper and orientation" button and change the orientation option to Landscape and click on Ok on both windows. 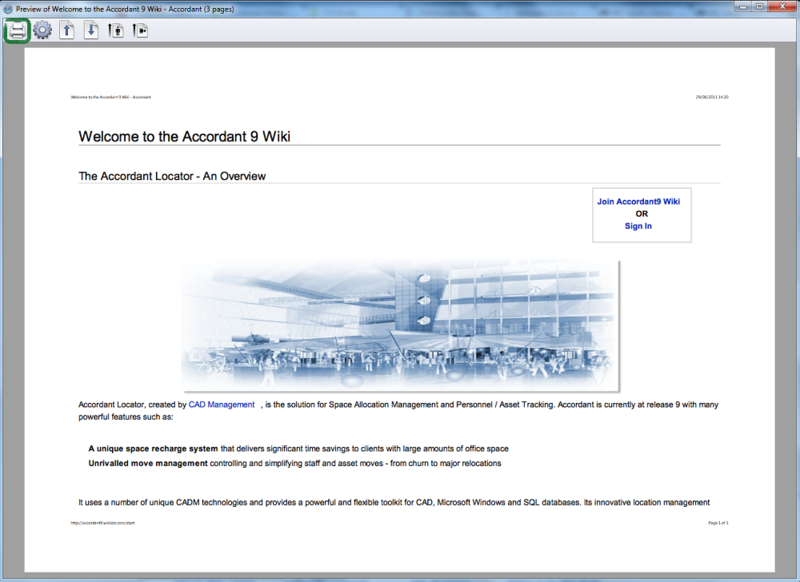 Now, refresh the print preview that takes you back to the browser page and your Accordant9 Wiki page is optimized for printing. Hit Ctrl+p at the browser window, this launches the print window. 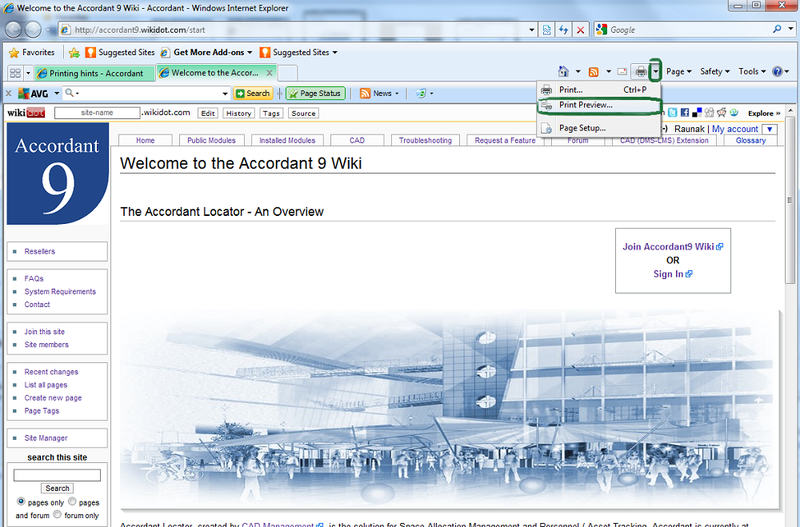 Click on Properties to open the Document Properties window. Select the Effects tab as illustrated in the figure and set the % of actual size to 70. Move on to the Finishing tab and set the Orientation to Landscape. Click on Ok when done. This should make the print window active again. Click on Ok to start printing the required pages with the saved document properties or click Cancel to perform a print preview first. 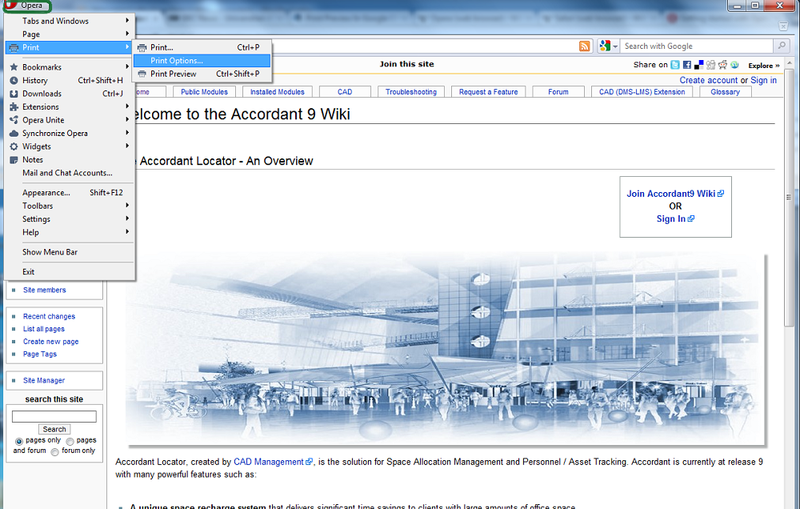 To perform a print preview, hit the alt button while viewing the required page. 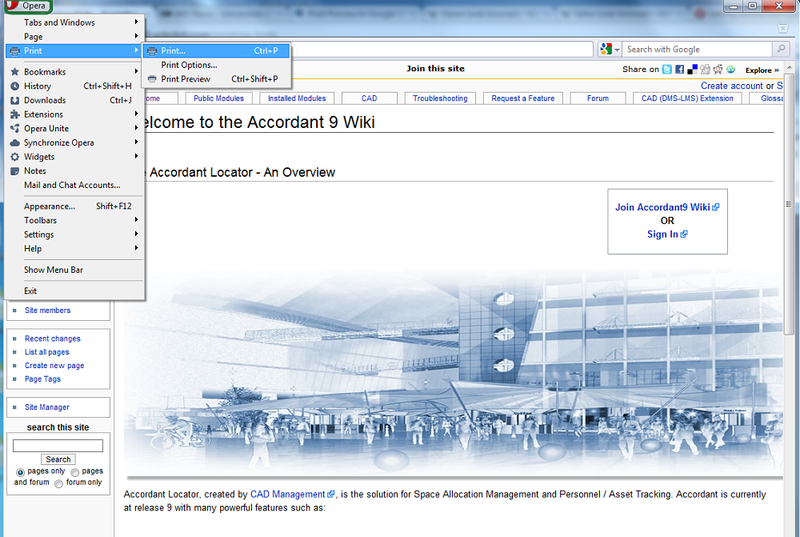 This should display the top horizontal menu at the top left corner of the browser, navigate to the Print preview option as shown in the following figure. This launches the print preview window. Unfortunately, at the Safari print preview window there is no way of setting the print to scale size. Hence, the suggestion to perform those actions via Ctrl+p. You can hit the print button to start printing. See figure. Hit Ctrl+p, this launches the Print window. 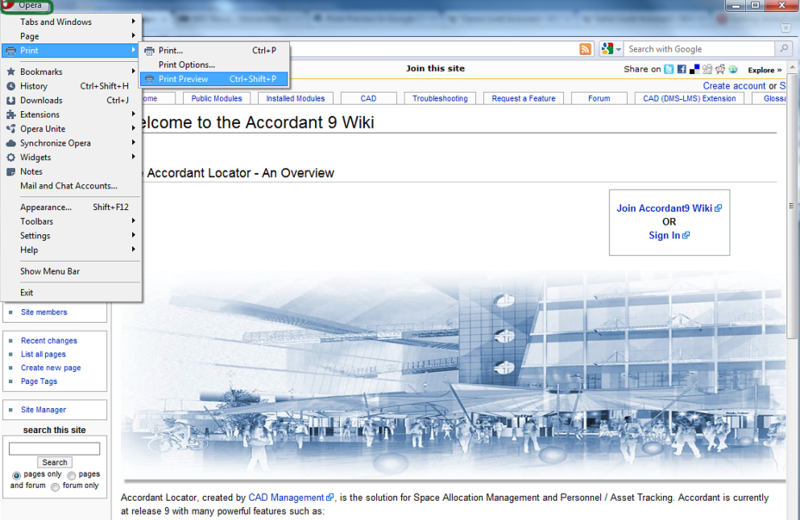 Click on the Preferences button as shown in figure. The preferences button causes the Printing Preferences window to pop-up. Select the Effects tab and set the % of actual size to 70 as shown in figure below. Move on to the Finishing tab and set the orientation to Landscape and click on Ok.
Click on Apply to enable the changes first and Print to print the required pages. Unfortunately, there is no print preview option available for Google Chrome (the newer versions are reportedly equipped with the option) but, you can try and download some plug-ins available freely on the internet for this feature to be present in Chrome.